Help investigate whether Northern Irish lowland grasslands are supporting breeding waders. In the late 1980s, a series of surveys discovered that lowland damp grassland areas were particularly important to Northern Ireland’s breeding waders, with over half the total estimated population being found in these sites (Partridge and Smith, 1992). Lowland sites which were surveyed as part of this original study have not been specifically revisited for breeding waders since. 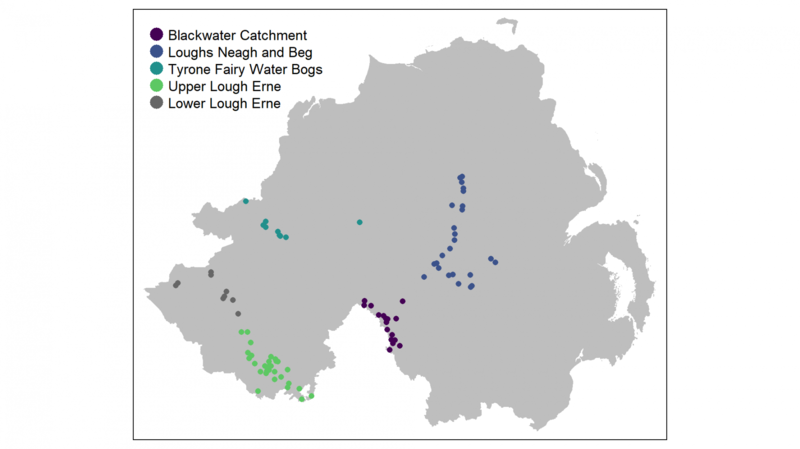 This information will enable the Northern Ireland Environment Agency (NIEA) to better target management strategies such as the application of breeding wader agri-environment scheme options and site designation to sites of particular importance. Findings will also benefit conservation NGOs and landowners to focus conservation management strategies to aid the maintenance and recovery of breeding wader populations in Northern Ireland. We are looking for volunteers to help with this survey in 2019. Sites are discrete lowland wet grassland areas small enough to survey in one morning. At least two or ideally three visits to each site are required between mid-April and mid-June, with at least two weeks between each visit. Each field or sub-unit must be covered on foot and the number of Lapwing, Curlew, Redshank and Snipe are counted per field. Some additional habitat recording is required, e.g. recording grazing, rush cover and estimating dampness). Sites are on average 0.43 km2 (between 0.01km2 and 3.24km2) in size. It is expected that each survey visit may take up to 3 hours, depending on the size of the site, excluding travel time. The survey requires a good level of fitness for walking the site, the ability to identify four species of wader (Curlew, Lapwing, Redshank and Snipe) and identify breeding behaviours (displaying or territory defence). Volunteers are also required to record some simple habitat data, therefore a familiarity with the habitats and farming practices of Northern Ireland is desirable. A training event to introduce volunteers to the survey methodology is scheduled for the 29th March, in Magherafelt, Co. Londonderry. For more information on taking part, please contact the survey coordinator, Katherine Booth Jones - katherine.boothjones [at] bto.org. Thanks to the Northern Ireland Environment Agency for funding the Northern Ireland Lowland Breeding Wader Survey, and to the volunteers and RSPB staff members who provided data in 2018. The methodology for this survey replicates that of the original survey by Partridge (1987). Partridge, J. K. (1987) Final Report: Northern Ireland Breeding Wader Survey. Report to Department of the Environment (Countryside and Wildlife Branch) Northern Ireland. Sandy. Partridge, J. K. and Smith, K. W. (1992) ‘Breeding wader populations in Northern Ireland, 1985--87’, Irish Birds, 4, pp. 497–518.